Welcome to the BTE Racing Car of the Week series, where we feature BTE customers and fans, and the cars (and trucks) they love to drive and race. 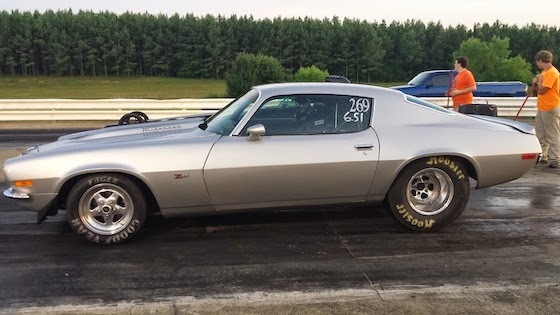 Today, it’s all about Brady Murks of Lexington, AL and his 1971 Z28 Camaro. I got my start in racing through my Grandad when he bought me my first Jr. Dragster. I was eight years old. My first race was at US 43 in Lawrenceburg, Tennessee. The car I drive now is a 1971 Z28 Camaro. My car is powered by a 440 small block from Wilkerson Racing Engines. I have a BTE transmission case. I use BTE, because they have highly reliable products. I look up to Clay Millican, because I met him in Huntsville and talked to him. He seemed like a very likeable guy that works hard for what he has. My pre-race ritual is to take a deep breathe, close my eyes and focus on the tree.